So much variety! For a while, it was looking like we might have a 4-or-5 way tie for first place. 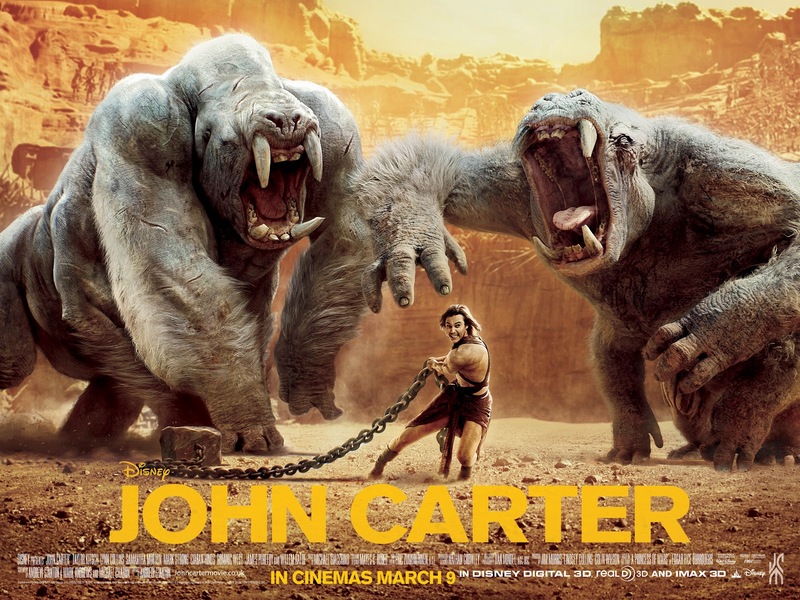 Disney’s 2012 bomb, John Carter, seems to have its fair share of fans, and it has received a better reception — 6.6 on IMDB, 51% Rotten Tomatoes — than many of the other films on this list. Suppose I might give it a shot after all. This Week’s Poll: Over the weekend I had a bit of a movie mini-marathon, and one of the biggest highlights was the 1940 classic, His Girl Friday (for my project, so expect a post soon). The rapid-fire dialogue had me hooked right away, and it was so much fun watching Cary Grant and Rosalind Russell play off each other. Grant has long been one of my favorite “classic” actors, so it’s surprising that it took me this long to finally watch it. This week’s poll is related to Mr. Grant, specifically: what are your TWO favorite Cary Grant films? Great poll result, had a feeling John Carter would be in top place. Its nowhere near as bad a film as I thought it would be, its quite fun, and the special effects are great. Yeah, I think I might check it out after all. Yeah, it worth a look, quite a good film. Oh God I thought John Carter was so awful. I’d totally watch it again though. For the lols. (And a half naked Tim Riggings). Standard. I voted for North by Northwest and Charade, both great films. Nice picks — love both of those films! Damn! Didn’t vote last week and totally would have voted for Death to Smoochy (an all-time favorite film of mine). Haven’t seen John Carter. This week, I went with Arsenic and Old Lace and Bringing Up Baby, in that order. I find both to be hilarious. Grant was a great actor, but I really prefer his comedic movies more than anything else he did. I have a soft spot for Death to Smoochy as well. I haven’t seen it in years, but I remember really enjoying it back then. Those are two Grant movies I haven’t seen, unfortunately. I nearly included both of them in my project but ultimately went with His Girl Friday. Will have to check them out soon anyway. Pleasant surprised that ‘John Carter’ walked away with the poll. Cary Grant is always a toughie. Being in charge: Only Angels Have Wings. Hi Jack, some great picks right there. Charade is a lot of fun — Grant sure knew how to charm even at 60 years old! North by Northwest and Notorious are the only two on the list I’ve seen, but they’re both great films, so that works out OK. Of course, there’s a lot on the list that I want to see, His Girl Friday among them.